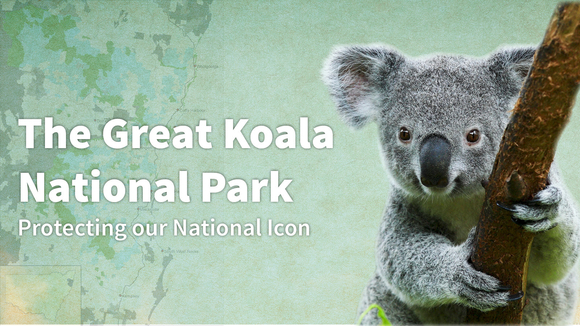 Please proclaim the Great Koala National Park! In signing this petition I am writing to express my concern over the alarming decline of koalas in NSW and to pledge my support for the Great Koala National Park. I strongly believe that this park is the best chance we have of securing a future for this iconic species in NSW. Koala numbers have plummeted by a third in just 20 years and habitat loss, due to land clearing and urban development, has already resulted in koalas disappearing from 75% of their former range. Populations were under serious threat from land clearing, disease, dog attacks and cars. The Victorian Government is on the verge of establishing a new national park to protect their faunal emblem, the Leadbeater’s possum. Yet here in New South Wales and across Australia, the koala, our national icon is declining rapidly. Please don’t stand by and watch this happen. Large protected areas like the Great Koala National Park remain the single most effective tool for conserving biodiversity worldwide. The proposed 315,000-hectare national park would protect the Bellingen-Nambucca-Macleay and the Coffs Harbour-Guy Fawkes koala meta-populations. It is estimated the area outlined for protection contains 4500 – or 20 per cent – of NSW’s remaining koalas. The proposal would add about 176,000 hectares of state forest to the existing 140,000 hectare local national parks estate. Please consider that this new reserve would not only protect two nationally significant koala metapopulations containing 20% of NSW’s remaining wild koalas, but also the many threatened species that share their home, such as the Spotted-Tailed Quoll, Hastings River Mouse and Powerful Owl. The short-term gains of unsustainable forest logging are far outweighed by the economic, social and biodiversity benefits the new park would bring. I urge you to commit to creating the Great Koala National Park so that future generations can enjoy koalas in the wild, as we do today.